Road accident is one of the most unwanted things that has ever happened to a road user, though they happen quite often. The most unfortunate thing is that we don't learn from our mistakes on the road. Most of the road users are quite well aware of the general rules and safety measures while using roads but it is only the carelessness on the part of road users which causes numerous accidents and crashes. It can be told that most of these deadly accidents and crashes occur as a result of human errors. Who is to blame! Well, everyone ranging from the drivers, pedestrians and the government all are to be blamed for these accidents per my view. These accidents have put too much pressure on the Ghanaian economy to the extent that monies have to be spent on providing treatment for victims involve in accidents and have also putting fears on Ghanaians and as a result, many do not even know which means of transport service to use. The most painful thing of all these is the fact that anytime it happens the government does not react fast but only spend monies mourning the deceased families. Can't the leaders use those monies to both provide educations to the pedestrians and renovate or construct good roads? Must we as a country still be struggling because of bad roads? Can’t we see we are losing lots of Ghanaians through our roads? Must the leaders deceive the voters and make them travel and not return? We must begin to think twice before the last Ghanaian standing dies. Let us remain ourselves ones more on several issues that could have prompted government actions and campaigns towards road safety but the government had remained close mountains. First, when the dancehall diva, Ebony died…it sparks public tensions towards road issues but within some weeks, everything was cool and no action was taken whatsoever. This is why I always say “issues in Ghana are only issues when public pressures are on them but the moment pressure is withdrawn from them…it becomes a needless case and no solution is provided”. We cannot continue like this as a country. The Government spent state monies giving Ebony a state burial, what can it add to the economy of Ghana. 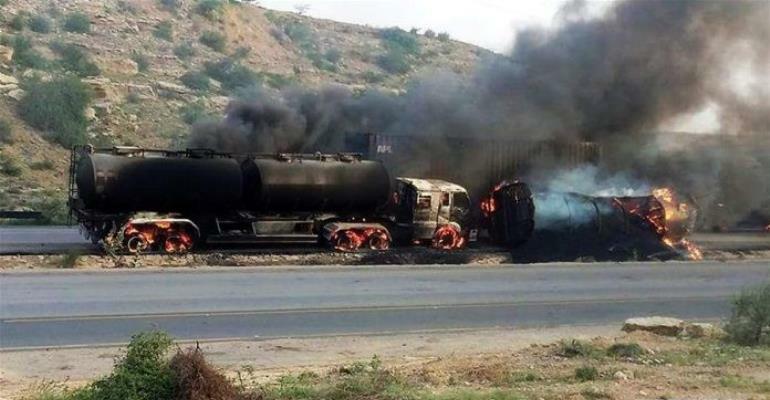 Even after that, several of such accidents occurred yet nothing has happened and the citizens are not holding the government accountable for such but only vote for the same people who do not care for their own safety. It is established that the safety and security of citizens does not mean government protecting the state from external aggressions, providing security personnel to prevent robbery on the roadside but it includes maintaining the roads in terms of making it spacious for passage, making traffic light workable and all other roads signs placed at appropriate junctions where necessary. That is what makes a working government the best for a state. Another shocking instance is the accident that occurred recently in the Bono East and Central Regions respectively. These two separate accidents have reduced the population of Ghana drastically. What is more shocking and devastating is the fact that our leaders could not even hold a press conference to assure the public on the issues and for that matter, the way forward but Ghana parliament had the guts to observe a minute silence to all members that were involved in the Ethiopian Air crash. What kind of hypocrisy is that or do our leaders think we the citizens do not matter to them and taking us for granted? Ghanaian must think well because absolute sovereignty resides in them. It is however observed that about 90 people died in the two separate road crash that occurred on the Black Friday (22/03/2019) and the Police have confirmed 55 died in the gory head-on collision between two passenger buses on the Kintampo-Techiman road and 53 others were seriously injured. The Kintampo Divisional Police Commander, ACP Joseph Antwi Gyawu, however, told Joy News that, 35 of the deceased could not be identified due to the extent to which they were burnt in one of the buses. This is disastrous, don’t we have leaders? Must citizens be dying like animals? Does it mean the citizens’ safety is no longer a priority to the leaders? Or better still, we think the free SHS was rather beneficial than the lives of the many who left us due to the improper management and control of road accidents. Let us look at some statistics concerning issues of accidents and the kind of monies that go into treating the victims. Statistics show that Ghana spends up to $230 million every year treating injuries and traffic fatalities. To make matters worse, there is fewer than 80 orthopedics in the country with limited access to emergency treatment. At a training workshop on trauma reporting for journalists from the Ashanti and three regions of the north, Senior Specialist on Trauma and Orthopedic Surgery at the Combo Anomy Teaching Hospital, Dr. Dominic Konrad Deborah, called for more awareness and investment in the sector to reduce the incidence. It overwhelming to know that, over $230 million is lost annually to trauma in Ghana due to accidents and there are also figures that suggest that in a period of 1 year, we have over 5,000 reported fractures. 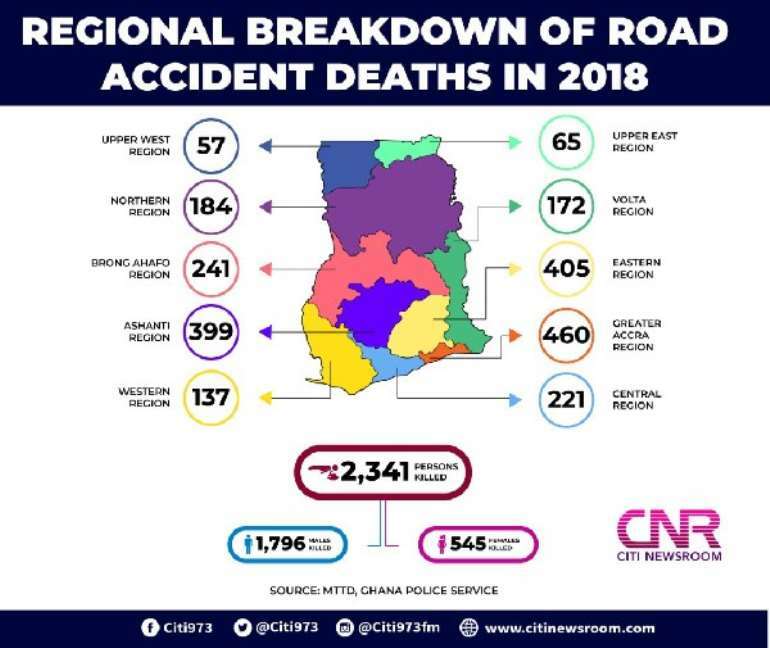 The statistics from the Motor Traffic and Transport Department of the Ghana Police Service indicates that road accidents in the country continue to upsurge with many more people dying from road crashes. More men than women perish in road crashes with some being pronounced dead on arrival at health facilities. Among the challenges with injuries from road accidents that are reported were the delay in transporting road accident victims to nearby health facilities and lack of knowledge in handling such victims or administering first aid that could buy victims more time before reaching a nearby hospital. Let ask ourselves, where are our leaders? Must we join their "All Die be Die" and "Boot for Boot" campaign for their selfish political agendas? Should our leaders neglect our problems and concentrate on spending monies to train vigilante group for our own destructions? Ghana, we must grow because we can do better than that. Look at this figure below just for 2018 meanwhile 2019 has already started with its own stories. When would we learn from our mistakes, when would we change our attitude towards these problems. I cannot think far, just maybe we are waiting for the second coming of Jesus to rescue us. Still, on statistics, Data compiled by the Motor Traffic and Transport Department (MTTD) of the Ghana Police Service has revealed that the total number of travelers killed in road traffic accidents in 2018 recorded a 12.76% jump over the figure for 2017. This means persons killed rose from 2,076 in 2017 to a total of 2,341 in 2018. It comprises 1,796 males and 545 females. Don’t our leaders saw the statistics? or they don’t care about us? Or they think it is just a mere embellishment of the figure? It is high time the government has got to invest much in maintaining road safety in this country or they think we are in a jungle where everyone is for the self and God for us all. No, we gave them the authority to protect us and they must do so!! In case you are not aware, let me humbly remain you that road accidents are a national issue in Ghana and governments must treat it as such. 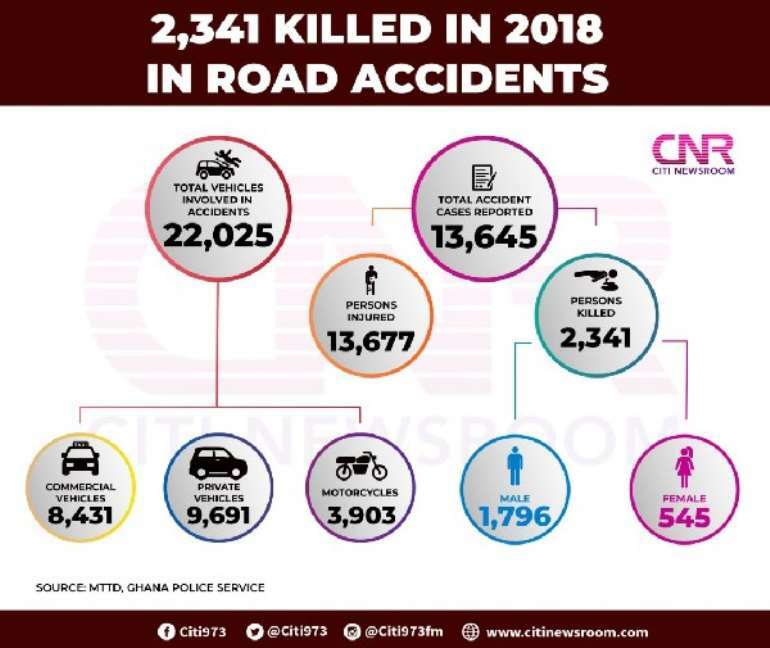 Meanwhile, data from the National Road Safety Commission shows that four people die daily on Ghanaian roads due to road accident and the estimates equally showed that Ghana loses over 230 million dollars yearly due to road accidents with more than 1600 deaths. When would we learn and grow because the loss correlates to 1.7% of the country's Gross Domestic Product? The NRSC announced in 2010 that there were 19 fatalities per 10,000 vehicles in Ghana. However, the statistics showed that 43% of the fatalities involved pedestrians and 53% involved occupants of vehicles and 23% of all pedestrian fatalities involved children below the age of 16 years, what!!! Hmm, God save us. Let us look at the figure below for the breakdown of road accidents in terms of a regional basis. This data or breakdown is taken from the then ten regions of Ghana thus; Upper East, Upper West, Northern, Volta, Brong Ahafo, Ashanti, Central, Greater Accra, Western and Eastern Regions. It is very shocking and surprising we have lost millions of Ghanaians in this country. We are failing to understand that, one of the factors that make a country great like the US and others is Population. Regional Ministers are working and seeing all these problems right from time immemorial till now yet no actions have been taken to curb these them from happening. It is very painful all these things are happening and Ghanaians are observing and not saying anything about them. Don’t we know the causes? Because something that has a cause always has a cure and so why are we not doing anything about them? If we don’t know the causes, let me remain us that although Ghana’s roads are considered one of the safest on the continent, the absence of dual-carriage roads leading to major towns and cities has been cited as contributing factor to crashes, a lot of them resulting in fatalities. A number of the cases recorded are also due to carelessness on the part of drivers while many others are caused by mechanical faults. To prevent or manage these things, the government through the DVLA should make sure driving licenses are issued to proper and qualified persons and all private driving schools must be regulated and supervised often. The pedestrians should be educated on the proper crossing of roads since the major cause of road accidents in Ghana is due to excessive speeding. The carelessness on the part of passengers forcing drivers to speed fast must also be avoided. Drivers should equally check their vehicle’s engines properly to avoid mechanical faults. Together, we shall fight road accidents and we must save our colleague Ghanaians. I stand for the interest of the citizens and with a persistent fight, Ghana shall grow.